Multiple silver cuff bracelets in one Lortone barrel? Thanks for your very helpful website. I just bought a Lortone tumbler for finishing flatware jewelry. I'm considering tumbling more than one fork bracelet at a time. Should I worry about the bracelets scratching one another in the tumbler? I'm attaching a photo of the bracelets. 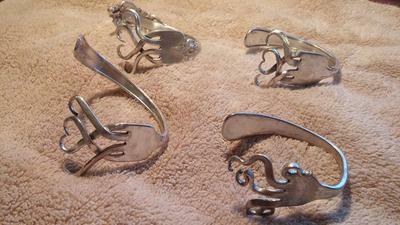 As for the flatware material, I'm working in sterling silver primarily. I might experiment with polishing silverplate, as well, but first I want to master the sterling technique. Your concern is valid as sometimes large items with a lot of surface area, can scratch each other in a tumbler. The size of the barrel you're using and how much shot you have in it, helps determine what and how much you can tumble at one time. All that being said, I find using a buffing machine the most effective way of adding a high polish sheen to large cuffs. You would have to be VERY CAREFUL buffing cuffs of yours on a large buffing machine! Tumbling with stainless steel shot is a gentle procedure. The heavy silver-plate should tumble OK and come out nicely polished. Avoid tumbling plated items in mediums designed to remove deep scratches, etc. If you do need to remove deep scratches and other surface blemishes from your Sterling ware (not plate), try using a flex-shaft or dremel fitted with small 3M radial bristle discs and then tumble to polish. The discs are available in different grits to be used for heavy cleaning, pre-polishing, semi-finishing, blending, texturing, etc. Pick them up from your favorite jewelry supply. Nope, not a paid ad for the 3M discs, but they may be a good fit for you along with tumbling.